Everyone, I need to stop with all of the fun posts, the Dr. Carson ribbing, the religious rants and the general nonsense that constitutes my facebook page. Today I received some very sad news that one of the most wonderful people I have ever known has been diagnosed with stage 4 lung cancer. While this is a terrifying diagnosis, I believe Gina Hollenbeck will be able to win this fight. 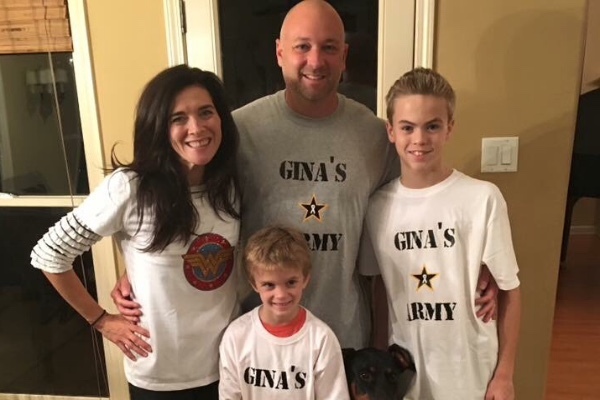 I would like to, in all seriousness, encourage EACH of you to drop by Gina’s gofundme page : https://www.gofundme.com/GINASARMY and donate. This is about to be the wildest ride this family has ever been on. And while your positive thoughts, prayers, and well wishes carry with them ‘good vibes’ its your donation that can really make the difference in their daily lives as they struggle to come to terms with this new situation and all of its implications. Please, if you were going to give to my MoVember cause, dont. If you were going to get get a second latte today. Dont. Please do as little or as much as you can, but please do SOMETHING. There, that’s all got, I hope it helps.